The insertion of a controlling element can generate an unstable allele of a locus, designated mutable. This instability can be seen both in somatic and in germline tissues. The instability can result from reversion of a mutation, due to the excision and transposition of the controlling element. After excision and re-integration, the transposable element can alter the expression of a gene at the new location. This new phenotype indicated that the element was mobile. An example of the effects of integration and excision of a transposable element can be seen at the bronze locus in maize (Fig. 9.8). The aleurone is the surface layer of endosperm in a kernel of maize. The wild type has a deep bluish-purple color. This is determined by the bronzelocus. The Bz allele is dominant and confers the bluish-purple color to the aleurone. The bzallele is recessive, and gives a bronze color to the aleurone when homozygous. In Bzkernels, anthocyanin is produced. Bzencodes UDPglucose:flavanoid 3-O-glucosyltransferase (UFGT), an enzyme needed for anthocyanin production. The loss-of-function bz alleles have no UFGT activity, and the bluish-purple anthocyanins are not produced. Some alleles of bronze show an unstable, or mutable, phenotype. In the bz-malleles, clones of cells regain the bluish-purple color characteristic of Bz cells. This produces patches of bluish-purple color in the aleurone of kernels (Fig. 9.8). This mutation in the bz-mallele is the insertion of the Ds(dissociation) transposable element. Dsdisrupts the function of the UFGT gene to give a bronze color to the seed kernel. 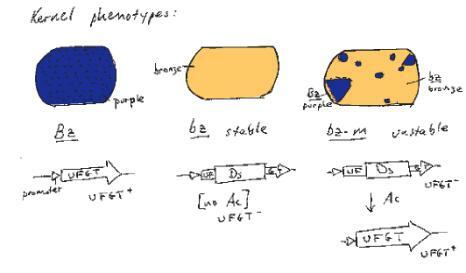 In the presence of the Ac(activator) element, the Ds can excise from the locus, restoring a functional UFGT gene (and a bluish-purple color). This occurs in some but not all cells in the developing seed and is clonally inherited, resulting in the patches of blue on a bronze background for each kernel. Figure 9.8. Frequent excision of a Ds allele generates an unstable, or mutable, phenotype at the bronze locus. Movement of DNA segments can be observed by a variety of modern techniques. In organisms with a short generation time, such as bacteria and yeast, one can simply monitor many generations for the number and positions of a family of repeated DNA elements by blot-hybridization analysis of genomic DNA. Using a Ty-1DNA fragment as a probe, about 20 hybridizing bands could be seen at the start of an experiment, meaning that about 20 copies were present in the yeast genome. The size of the restriction fragment containing each element was distinctive, as determined by restriction endonuclease cleavage sites that flanked the different locations of each element. After growing for many generations, some new bands were observed, showing that new Ty-1elements had been generated and moved to new locations. These observations led to this family of repeats being christened Ty-1, for transposable element, yeast, number 1. Evidence for transposition in many organisms comes from analysis of new mutations. Transposable elements appear to be the major source of new mutation in Drosophila, and they have been shown to cause mutations in bacteria, fungi, plants and animals. One example from humans is a new mutation causing hemophilia. A patient from a family with no prior history was diagnosed with hemophilia, resulting from an absence of factor VIII. By molecular cloning techniques, Kazazian and his colleagues showed that the mutant factor VIII gene had a copy of a LINE1, or L1, repeat inserted. In contrast to most L1 repeats in the human genome, whose sequences have diverged from a predicted source gene, the sequence of this L1 was very close to that predicted for an active L1. Tests showed that the patient’s parents did not carry this mutation in their factor VIII genes. Screening a genomic library for L1s that were almost identical to the mutagenic L1 revealed a full-length, active L1 that was the source, on a different chromosome. The appearance of a new L1 in the factor VIII gene, making an allele that was not present in the parents, is a strong argument for transposition. The further studies identifying a source gene and showing that the source gene is active in transposition make the evidence unequivocal. Now that it is recognized that most repetitive elements in many species result from transposition events, it is easy to find transposable elements or their progeny. A comprehensive database of repetitive elements in many species is maintained as RepBase (J. Jurka) and the program RepeatMasker (Green and Smit) will widely used to find matches to these repeats. Virtually all these repeats are made by transposition.